About 20 years old, this signed "Sligh" mantel clock has a German signed "Franz Hermle" movement. The brass weekly wind movement is jeweled and keeps excellent time. A lever controls silent, St. Michael's, Whittington, or the familiar Westminster chime tunes. An ascending measure of each melody plays on the quarter hour, and the hour is counted as well on resonant chimes. The mahogany case has a superb glossy finish with inlaid satinwood and ebony marquetry. 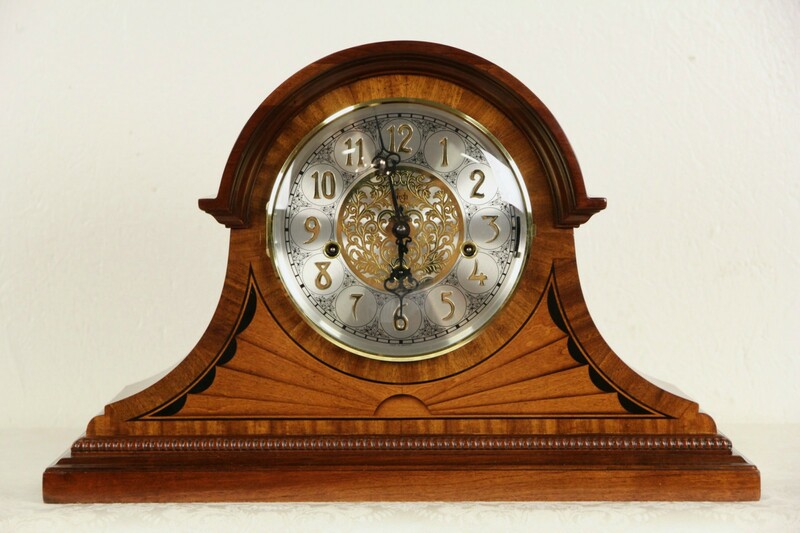 A lavish dial has gold numerals and filigree on this vintage clock. Size is 19" wide, 6" deep and 12" tall.